Earn 235 - 420 points upon purchasing this product. 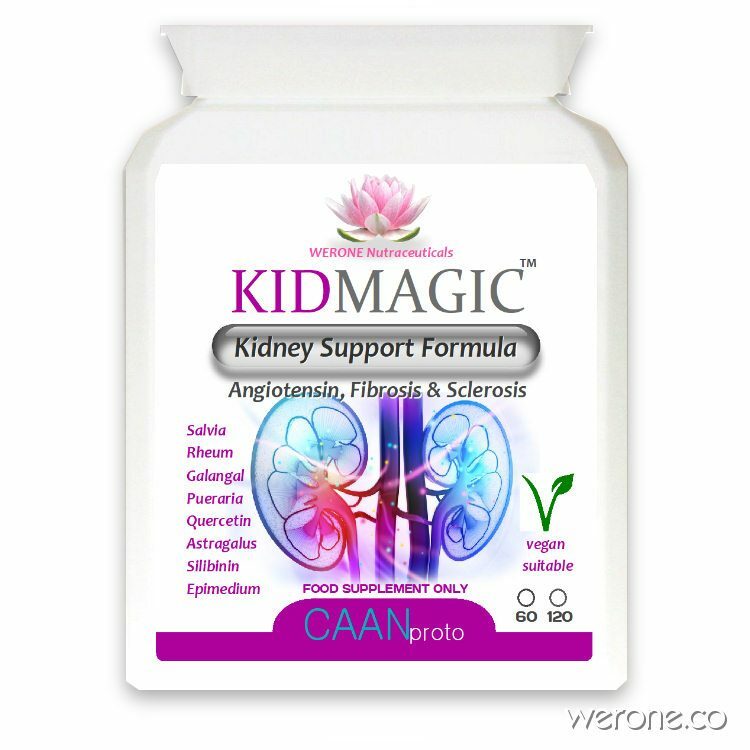 Enhance, protect and restore the function of your kidneys and bladder. Take this formula to nurture, cleanse and detoxify your kidneys and bladder and protect these organs from damage associated with inflammation, oxidation and infections. Use 2350 - 4200 points to purchase this product! KIDMagic™ formula has been prepared using the work of Travis Spire-Sweet, L.Ac. who compiled this article Renal Disease & Chinese Medicine where he outlines the safest most effective herbs known for use with Renal Diseases and other study-based information from Flavonoids in Kidney Health and Disease. KIDMagic™ can be used alongside our RENALiV™ tincture. Kidneys play a role in removal of toxic products from the body and maintain fluid, minerals and electrolyte balance at physiological level. But an elevated blood glucose level could be a prognostic factor for damage to the various segments of the nephron causing chronic kidney disorders . Other prior studies also strongly support that hyperglycemia poses higher risk of nephropathy [29, 30]. These compounds attenuate the hyperglycemia-disrupted renal endothelial barrier function, urinary microalbumin excretion, and glomerular hyperfiltration that results from a reduction of podocyte injury, a determinant factor for albuminuria in diabetic nephropathy. Several flavonoids have shown renal protective effects against many nephrotoxic agents that frequently cause acute kidney injury (AKI) or chronic kidney disease (CKD), such as LPS, gentamycin, alcohol, nicotine, lead or cadmium. Flavonoids also improve cisplatin- or methotrexate-induced renal damage, demonstrating important actions in chemotherapy, anticancer and renoprotective effects. A beneficial prophylactic effect of flavonoids has been also observed against AKI induced by surgical procedures such as ischemia/reperfusion (I/R) or cardiopulmonary bypass. In several murine models of CKD, impaired kidney function was significantly improved by the administration of flavonoids from different sources, alone or in combination with stem cells. In humans, cocoa flavanols were found to have vasculoprotective effects in patients on hemodialysis. Moreover, flavonoids develop antitumor activity against renal carcinoma cells with no toxic effects on normal cells, suggesting a potential therapeutic role in patients with renal carcinoma. Quercetin: Quercetin downregulates the renal expression of epithelial Na+ channel (ENaC) in hypertensive Dahl salt-sensitive rats, and this effect is associated with a reduction in systolic blood pressure (Aoi et al., 2004). The ENaC plays a key role in the kidney, regulating Na+ reabsorption in renal tubules, and quercetin also stimulates the Na+-K+-2Cl− cotransporter 1 (NKCC1), a key ion transporter regulating cytosolic Cl− concentration (Marunaka, 2017). NKCC1 activation affects several body and cellular functions, such as renal Na+ reabsorption, thereby regulating the concentration and volume of extracellular fluid (Figure 2). Renal Na,K-ATPase is an important regulator of sodium homeostasis in the organism, and its activity is enhanced in spontaneously hypertensive rats (SHRs). Mezesova et al. (2010) reported that quercetin reduced Na,K-ATPase activity and affinity to the sodium binding site in both normotensive and hypertensive rats. Silibinin / Milk Thistle: In vitro and in vivo studies have demonstrated the anticancer capabilities in renal cell carcinoma cells of silibinin, an antioxidant flavonoid extracted from milk thistle, which inhibited renal cell carcinoma growth through caspase-dependent apoptosis (Ma et al., 2015). In an in vivo mouse xenograft model, silibinin also reduced tumor growth, specifically targeting the mTOR-GLI1-BCL2 signaling pathway. Galangal: Galangin, a flavonoid extracted from the root of Alpinia officinarum was reported to possess antiproliferative action and to inhibit renal cell carcinoma (786-0 and Caki-1) invasion by suppressing EMT, inducing apoptosis and producing ROS in renal carcinoma cells (Cao et al., 2016). Han et al. (2016) observed that the combination of galangin and TRAIL significantly induced apoptosis in renal carcinoma (Caki, ACHN, and A498) but not in normal mouse kidney cells or human normal mesangial cells, suggesting the potential utilization of galangin as a sensitizer of TRAIL-resistant cancer cell therapy. Meng et al. (2015) combined quercetin with anti-sense oligo gene therapy (Snail gene inhibition) and found that each suppressed the proliferation and migration of Caki-2 cells, inducing cell cycle arrest and apoptosis, with a strong suppression of renal carcinoma cells being achieved by their combination. Their findings supported this combination of natural product and gene therapy as a novel treatment for renal cancer. In addition to Angelica sinensis, the use of other (Renoprotective Chinese Herbal Medicines) RPCHMs was associated with a lower risk of all-cause mortality. Among the other RPCHMs evaluated in this study, Astragalus membranaceus is also commonly used in CHM. It is usually prescribed in conjunction with Angelica sinensis, a combination therapy that has been found to inhibit renal tubulointerstitial fibrosis in rats with obstructive nephropathy [19, 35]. Epimedium: Icariin, a kidney-tonifying active flavonoid component of the Epimedium plant species, widely used in Chinese medicine, protected against renal function impairment and histological abnormalities secondary to chronic renal failure produced by 5/6 nephrectomy (Huang et al., 2015). Icariin also reduced TGF-β1 expression, increased CD24, CD133, Osr1, and Nanog expressions, and augmented the number of CD133(+)/CD24(+) renal stem/progenitor cells, considered responsible for these protective effects. Two capsules 3 times a day with warm filtered water on an empty stomach. Additional kidney support is achieved with higher fibre diet. This can be achieved by daily smoothies consisting of parsley and lemon, blended rather than juiced. Take activated charcoal 2 hours after meals to help bind toxins further supporting the kidneys. Other Ingredients: (Capsule: Vegan HPMC, no fillers. There are a number of foods and herbs that are essential to AVOID with End Stage Renal Disease (ESRD), here’s a document from Travis with a list of them. Other useful ingredients for Kidney support are Cordyceps/Reishi (capsules) and Rehmannia Tea . Shenkang granules (SKGs) are a Chinese herbal medicinal formula used for Chronic renal failure (CRF), consisting of rhubarb (Rheum palmatum L.), Salvia miltiorrhiza, Astragalus membranaceus Root and safflower (Carthamus tinctorius L.). SKG may increase the removal of toxicity products, remove oxygen free radicals and reduce the free radical-induced damage of kidney tissues & markedly reduce the serum concentration of TGF-β subsequently improving renal function. Bovine Colostrum Powder – Up to 33% OFF! Werone's rare and unique premium red dulse (seaweed) powdered capsules contain dulse hand-harvested from the Wild Atlantic Irish Sea, then sun-or shed dried. Powdered Dulse capsules help to alkalise the body and contain 10 to 20 times more bio-available minerals and vitamins than land vegetables, with zero fat and low calories, making them the perfect nutrient rich addition to your heavy metal detoxification regime.